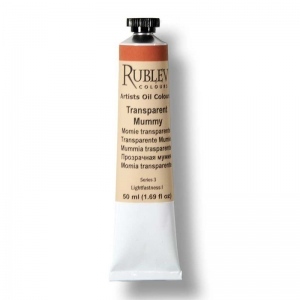 Rublev Colours Transparent Mummy is a semi-transparent deep red with orange undertones, medium grained, average tinting strength and brushes "long" in the direction of the brush stroke. The red earth comprising Rublev Colours Transparent Mummy Artist Oil is Mummy Red Light pigment from quarries in Lori province of northern Armenia. Transparent Mummy derives its name from the Russian word мумию that denotes a pigment of brownish red color similar to the nineteenth century pigment derived from mummies. Mummy brown was originally made in the sixteenth and seventeenth centuries from pitch, myrrh and the ground-up remains of Egyptian mummies. As it had good transparency in oil paint, and was used for glazes, shadows, flesh tones and shading. It fell from popularity during the nineteenth century when its composition became more generally known to artists. 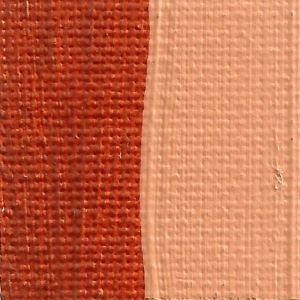 The modern pigment sold as "mummy" is composed of a mixture of kaolin, quartz, goethite and hematite; the hematite and goethite (generally 60% of the content) determining the color—the more hematite the redder the pigment—with the others being inert substances that can vary the opacity or tinting strength. Red iron oxide or ferric oxide is the principle coloring agent in red ochers, such as Mummy Red Light. This color is based on the natural mineral hematite associated with varying proportions of other minerals such as clay, chalk and silica. They differ from other ochers in that they do not contain water bound with iron oxide. In other words, the iron to which they owe their color is iron oxide not hydrated iron oxide. Note: The scan of the "drawdown" (left) contains a pre-mixed paint film of 6 mil (0.006 inch) thickness applied to a standard test card for the purposes of examining color consistency, opacity and other qualities. The drawdowns show the color full strength (mass tone), on the left, and mixed in a 1:2 ratio with titanium white on the right. The bottom area of the drawdowns are scraped to show undertones. Note: Some separation of pigment and oil may occur in Rublev Colours Artists Oils and is a natural process when no wax or stabilizers are added to paint to prevent this from occurring.